After spending two days in a forest in Imo State, the anti-kidnapping unit of the State Police Command has rescued, unhurt, a Catholic priest, Rev. Father Charles Nwachukwu, who was abducted by some gunmen. This is even as the police have recovered a human skull in a shrine in Umualulu, in Ngor Okpala Local Government Area of Imo State. A police source told Punch correspondent today that the priest was abducted by the kidnappers on June 16, 2017, at Amauzari in the Isiala Mbano LGA of the state at about 8pm. Confirming the incidents to newsmen on Tuesday, the state Commissioner of Police, Chris Ezike, said the victim was rescued in an Agbaja forest in the Nwangele LGA of the state on Saturday. Agbaja is where the late kidnap kingpin, Henry Chibueze, popularly known as Vampire, was freed by his gang members in January at the premises of Imo High Court, Owerri; before he was finally mowed down during a gun duel with the police in Rivers State in February. The Police boss said that three suspects in the kidnap case of the Catholic priest were arrested by his men. 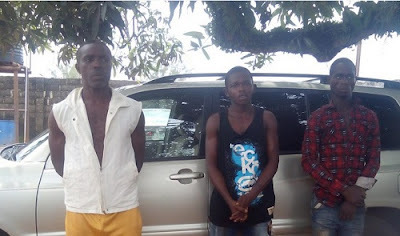 He gave the names of the alleged kidnappers as Ogadinma Ajonuwma, Chinedu Odoemenam and Uzoma Mejuru. Ezike said, “Rev Father Charles Nwachukwu has been rescued unhurt. He was rescued on Saturday in a forest in Agbaja in the Nwangele Local Government Area of Imo State. “Three of the kidnappers were nabbed immediately”. He said that the Toyota jeep, golden colour with registration number, WER 334 NJ belonging to the Catholic Church priest was also recovered by the police. The CP stated that the priest had identified the suspects as his abductors, to which the suspects had also made confessional statements. “The victim has identified the three suspects. They have also made confessional statements to us. Investigations are ongoing. “We will charge them to court. We will not rest on our oars until all the bad elements are flushed out of the state. “Imo people have a right to enjoy our protection and that is what we are offering them,” Ezike said. The priest said his abductors had demanded N100m ransom for his release. He said the suspects forcefully obtained the code of his ATM card and withdrew about a half a million Naira from one of his accounts. One of the suspects, Odoemenam, who confessed to the kidnap, said he was also involved in car snatching and other criminal activities. 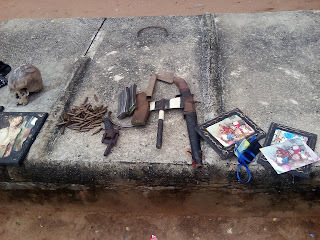 In addition to the human skull that was recovered from the shrine of a native doctor, Chidera Njoku, the CP said 82 rounds of ammunition, three AK-47 magazines, one locally-made revolver pistol, one locally made single barrel short gun, two axes, one identity card belonging to Njoku and photographs were recovered . Police has since declared the suspect him wanted. His mother has, however, been arrested; and is helping the police with the possible whereabouts of her fleeing son. “We got intelligence and information about the activities of the native doctor. “With the help of a search warrant, we searched his house and shrine, where we found the human skull and other exhibits. “He ran away. We have declared him wanted and his mother is with us. “She is helping us in the investigation. I assure Imo people that we will get him,” Ezike said.